"We tried everything for my daughter's gym fears, from visits to hypnotherapists, counsellors, psychologists and other therapies, but her fears were not going away. But being able to continually use your recording until the issue completely went away, this made all the difference". "My daughter began getting afraid of doing back handsprings and back flyaways, and eventually completely stopped all back tumbling. All the reassurance in the world made no difference and she was going to give up because she was not enjoying it anymore. I didnt even know these recordings existed, but they were our last hope. She especially loved going to sleep to the subliminal, and has since turned it all around and the problem has disappeared. All I can say is thank you, thank you, thank you". "Every team that aspires to compete at a championship level is looking for an edge over its opponents. Craig’s mental training techniques have provided our players with the tools to build a stronger mentality but also a confidence in knowing that they are better prepared than the teams we face". "This package has everything for our team's needs - great value, thanks". "I just wanted to express my thanks. I raced this week and won both the heat race and the main event…. YES…. I know that I found you, but I am grateful for your support and help. You put a lot of work into my success. This race meant so much to me.. I had many hurdles to accomplish my goal. Lots of "emotional stuff.. At this race was the best of the best… 35 drivers. Even though you did not know you were there, you were!!! Thank you so much". I had tried several other mental approaches and programs, and had a little success but I found them too vague and not lasting. I found that using Mind Training for Tennis program daily changed all of this for me. I've had unbelievable success, and I know there is no way I would have had the success I've had without it. The daily exercise feeds positive thoughts, images and calmness to my subconscious on a daily basis, and I've been able to recognize and keep those negative thoughts at bay. This was a HUGE step for me. I now am much more calmer and think positively. It is a part of my daily life now - the powerful images I visualize, relaxation and hypnotic suggestions are changing my outlook to handling tough tennis matches". "Hi Craig. I am returning for another purchase from your collection having experienced first hand the amazing powers from your programs. I bought "Mind Training for Tennis" about 1 - 1.5 yrs ago and I can say with all honesty that my game has gone from a 4.0 to a 4.5 thanks entirely to your program. 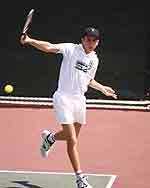 It has worked wonders to my game, which was not lacking in technique but was held back due to the mental weaknesses and your program has made me a very mentally strong competitive tennis player. "Just wanted to let you I got the recording and already listened to it twice and it's everything I expected and more. I love the affirmations. I honestly think this recording should be in the hands of every parent. My daughter Rebecca feels so special when she listens. I think it's already helped her self image. This recording is truly amazing. You are speaking all the very things I so want her to genuinely believe about herself. I will do everything I can to encourage and empower her to life a positive, happy life. Glad I have your resources to help me. It is an invaluable gift to give to your child. The gift of a healthy self image that will last throughout their life". "This been a godsend for us. In just a week or two we noticed improvements in her self confidence, and we are certain this will make a big difference to her for the future." "My daughter had experienced a few health issues that affected her competitive swimming ability. We resolved those issues but were left with a string of poor performances at meets resulting in frustration and a loss of confidence. I got a quote from a sports psychologist which would have been a minimum of $750.00 with no guarantee of success. We chose to try your Mind Training for Swimmers technique and she has faithfully listened every day for about 45 days. We just completed a Regional swim meet and she got 4 personal bests include the 100 fly. This used to be her best race, but she hadn’t had a personal best in about 1.5 years in this race. When she completed the race and look up at her time, she pumped her fist like she had just won the Olympics. I have never seen her do this before. Mind Training for swimmers has restored her confidence and renewed her love of swimming. I have listened to Mind Training for swimmers and it appears to me that every word and intonation was carefully chosen – probably refined over several years, resulting in a product that exceeded all my expectations. Not only does it work, but it was crafted so that she was convinced at the first listen that it was worth the effort of listening every day. She has not missed a single day. When she got home from the last meet of the season, guess what she did, listened again to Mind Training for Swimmers. She got personal bests in 4 of 6 races which hasn’t happened in years for her. I am convinced you solved her confidence problem. Thanks so much". "Craig - thanks a LOT for that visualization you sent us! The kids like it better than any other program they have heard, because it applies directly to swimmers. It is really terrific and we are thoroughly enjoying "mind training" better than ever before! As a coach, I really like the way you talk to the swimmer's subconscious mind on the recording. You are so positive, so encouraging - everyone needs to hear that kind of talk regularly. It makes you feel so good just listening to it. A really great part of a fantastic tape. Thanks!" "Your program is remarkable. While my son is young, I knew he had the discipline and desire to apply it. He has already shown marked improvement in all his times at recent meets and his practices have been much more consistent. He is very happy with it. We really want to explore the whole concept more. I use a lot of visualization when I ride and knew this would work. Thanks so much". "I would just like to say thanks for such a wonderful product. My daughter is only 11 and although has huge potential has been unable to overcome the mental side of team mate psych-outs, and was unaware of the methods sometimes used even at this age. After swimming very poorly at a recent qualifying meet I purchased the program in the hope that it would have an effect on her at State champs which were only 2 weeks away. We have followed the program for just 10 days and the results were fantastic. We came home with 100% Personal Best rate and 3 - 4 second 'personal bests', 3 finalist ribbons and 7 State qualifying times. She told me on the way home from the meet that she will not stop using the program as it has made a big difference to how she feels and thinks before, during, and after she has swam. She now BELIEVES in herself and her ability which just shone on the weekend. So thank you again and we look forward to further great results". "Hi Craig, Today is my first day back at work and I couldnt wait to email you. I purchased your program at the beginning of July. I ran the San Francisco Marathon and this past Sunday, I ran my very first Ultra Marathon (31 miles). I was a nervous wreck for these races once July 1st came. I decided to purchase your Mind Training to help me relax and focus on the races. Not only did I successfully finish both races but I've never felt better during the races and the rest of my training runs. Besides the usual aches and pains from running I felt incredible throughout the marathons. My breathing was on target, I had no cramps, I stayed focused and mostly I had an up beat and positive attitude the whole entire race. Even my friends who came to cheer me on told me that they couldnt believe how strong I looked after hours of running. I know this was due to your running program. I was skeptical at first and wondered if it would really work but I am amazed my your program. I just wanted to say thank you very much and I look forward to purchasing more from you in the future. Thanks again". "I brought your program earlier in the year. I love it! I wanted to say thank you very much! I really notice it working and you are sooo right the result of a race really is determined before getting to the starting line. I really wasnt sure I believed it until now". "I just wanted you to know that I bought your hypnosis for pool and I was skeptical at first but not anymore. I bought it in September and have played it for 5 days a week, sometimes six. I then play the subliminal recording before my matches. I’m seeing results and it’s hard to believe that it’s because of the recordings but after last night, I’m a believer. I played very well and I noticed I played in a relaxed state and took my time and played the game I should always be shooting. I know it also has to do with my practicing over the off-season but that is just for shooting better. My mind has to be in the right place and it hasnt been for quite some time. Now with the two together, I’m doing very well. Thanks for the help". "I want to commend and thank you again. I sparred Friday and again today. I am a different boxer. Both of my coaches both said "You're really improving, great job." That means a lot because they rarely give compliments! It's a wonderful tool that you have created!"